The Mystery This is a mystery because we don’t know what this is. Obviously: it is a small flying insect (size about 0.5-1 cm/0.2-0.4 inches) sitting on a blueberry plant (not an American blueberry plant, but the small one that grows in the mountains in Norway). None of the books we checked have given us any clues. We thought it was some kind of a mosquito as it is about the same size and shape, but when we captured a macro shot, we could see it was a far more sophisticated creature: The brushes on the wings are fascinating, what are they for….? And the eyes are so different from the normal facet eye of mosquitoes and other insects – we would appreciate if any of you recognize this one! UPDATE: The mystery is solved! Thanks for all your comments! 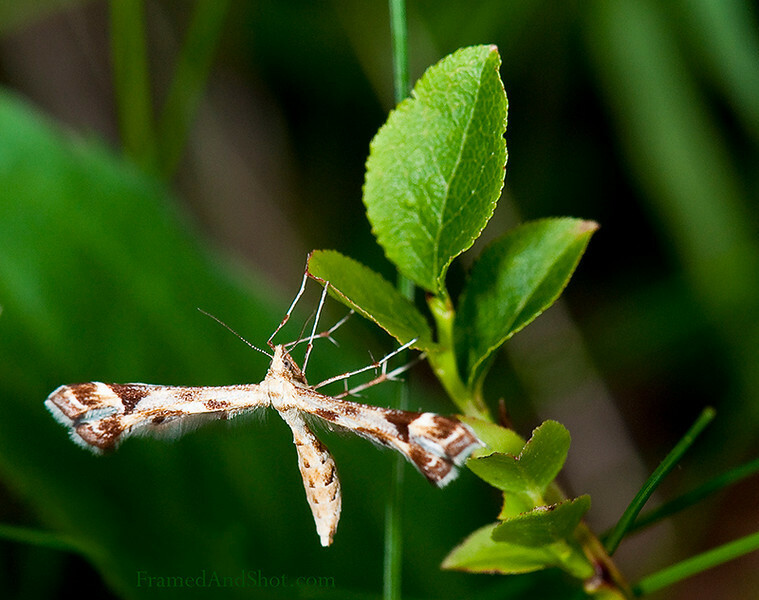 This is a moth of the genus Eulithis in the family Geometridae, called the Northern Spinach (Eulithis populata) and it lives on the bilberry plant. Bilberries is small blue berries (which in Norwegian are called blueberries), so this time we actually learned two things – the name of our mystery and the correct name for the delicious blue berries we enjoy when going to Norway in the fall – they are not blueberries they are bilberries! And we still think his eyes are magnificent – and blue, just like the berries!